Short Pump Dental strives to deliver the best when it comes to Henrico dentistry. We’re proud to offer comprehensive dental care that includes a wide array of services, from general treatment to cosmetic dentistry, to everyone in and around Henrico, VA. One of these services that we offer from our Henrico office is endodontics. Endodontics is the dental specialty that deals with the tissues and structures inside the tooth. The most common endodontic treatment is root canal therapy, a procedure that eases the pain associated with a bacterial infection deep within the pulp of a tooth. Root canal treatment won’t just ease the pain – it will stop the infection by removing the dead and decaying tissue within the tooth’s pulp. This can help save a tooth that’s in danger of being lost if it remains untreated. Endodontics isn’t just limited to root canal therapy. The field of endodontics also deals with dental trauma, it performs microsurgery on the tips of the tooth’s roots, and it can even help pinpoint the cause of intermittent tooth pain. When it comes to preserving your natural teeth, endodontics has plenty of ways to help you. So What’s Inside Your Teeth? Beneath the tough and shiny outer layer of your teeth known as the enamel lies the sturdy inner tissue that’s called the dentin. Dentin makes up the bulk of the tooth’s structure and is also found behind the cementum that forms the outer layer of the tooth’s roots. Dentin is similar in many ways to bone tissue in that it’s composed of many tiny tubules that can transmit sensations to nerve cells when it’s stimulated. At the core of the tooth and inside small branching chambers, we find the soft pulp tissue. This consists of nerves, connective tissues, and blood vessels that extend into the center of the tooth and exit through canals near the tips of the tooth’s roots. When problems develop in the pulp tissue, your first warning may be tooth sensitivity or even intense pain. As time goes on, the nerves will begin to die and the pain will subside – but the problems won’t. If it’s left untreated, the end result may be tooth loss. Untreated tooth decay – This can allow bacteria from a tooth’s surface to work its way deep inside the tooth. A tooth crack or fracture – This offers another way for microorganisms to infect the tooth’s pulp. Dental trauma – This may damage the dentin or pulp and expose it to infection. Extensive dental procedures or orthodontics – Multiple fillings or restorations on the same tooth can eventually cause problems. Even routine orthodontic procedures may lead to root canal problems. First, the patient will receive anesthesia, usually in the form of a numbing shot. 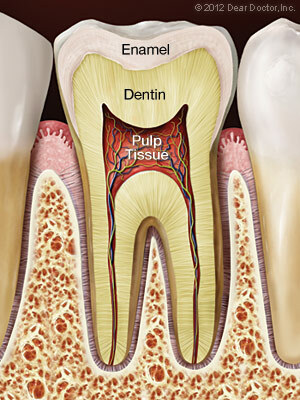 A small opening is then made in the tooth surface to give access to the pulp chamber and the root canals. Tiny instruments are then used (often with the aid of a microscope) to remove the dead and dying tissue from inside the narrow passages of the tooth. These passages are cleaned, disinfected, and filled with a safe and inert material. Finally, the opening into the tooth is sealed in order to prevent contamination. Following an endodontic procedure, a restoration (a crown, for example) will be placed on the tooth to restore it to its full function and normal aesthetic appearance. With proper care, the newly restored tooth should last many years. Contact Your Henrico Dentist Today! If you’re searching for Henrico dentistry, you’ve come to the right place! To schedule an appointment with us, we encourage you to give us a call at (804) 747-0116 or fill out our online appointment request form. If you have any questions for us, please don’t hesitate to contact us. We look forward to seeing you and giving you the healthiest smile possible!